Yishay Garbasz, Many Women in the Camp Started Suffering from Seizures, 2003–2004, color photograph, 19 x 24". From the series “In My Mother’s Footsteps,” 2003–2004. 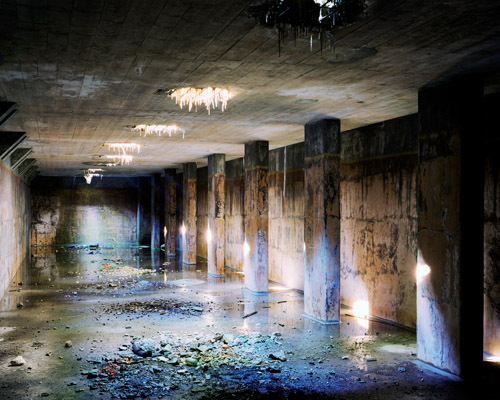 Some in Japan, on learning of photographer Yishay Garbasz’s Tokyo exhibition, with its images of Nazi death camps, wondered whether her work would only recapitulate the many series already documenting the Holocaust. But the combination of Garbasz’s photos and her mother’s narrative is a very different story: “In My Mother’s Footsteps” quietly reveals Garbasz’s search for her identity as a child of Holocaust survivors. Garbasz’s mother, Salla, who never spoke of her Holocaust experiences during the artist’s youth, much later gave her child a ten-thousand-word account of her experiences. Garbasz was ultimately motivated to retrace her mother’s footsteps through the five concentration camps Salla survived. With a large-format view camera, 150 pounds of equipment, and narrative in hand, Garbasz set out on a yearlong journey, from 2004 to 2005, to photograph all the sites and their environs. Her mother passed away in 2006, about two weeks after Garbasz gave her a handmade book of the work. Garbasz has said the process liberated her from the debilitating post-traumatic stress she inherited from her family and enabled her to finally identify with her mother. Poignant and beautifully photographed, Garbasz’s images are paradoxically incongruous and comforting—rail lines that carried Salla to Auschwitz, hidden in a weed-covered backyard; a road she walked during the infamous Bergen-Belsen death march, bordered by an opulent gold-painted hotel; an attic room she shared with her grief-stricken family, now decorated with green dots. In Salla’s narrative, the lack of emotion speaks volumes about her broken soul. Garbasz has transformed her broken inheritance into a joy for life, with a collaboration that speaks the unspeakable.